As always, Sterling and I look forward to our church’s semi-annual general conference. It was truly a spiritual feast, and I didn’t want it to end! Aside from getting up yesterday and today at 4:30 AM (that’s right…it’s tradition for the young single adults to watch it live!) to get dressed in church clothes, we enjoyed watching conference with members of our branch and eating breakfast and visiting together in between sessions. The talks and music were especially uplifting and inspiring, and the messages spoke to my heart. I laughed and cried, and I felt the Spirit testify of eternal truths. If you need a little uplifting, go to lds.org and watch or listen to some of the talks. It’s hard to choose, but two of my favorites were President Nelson’s and Elder Holland’s talks. 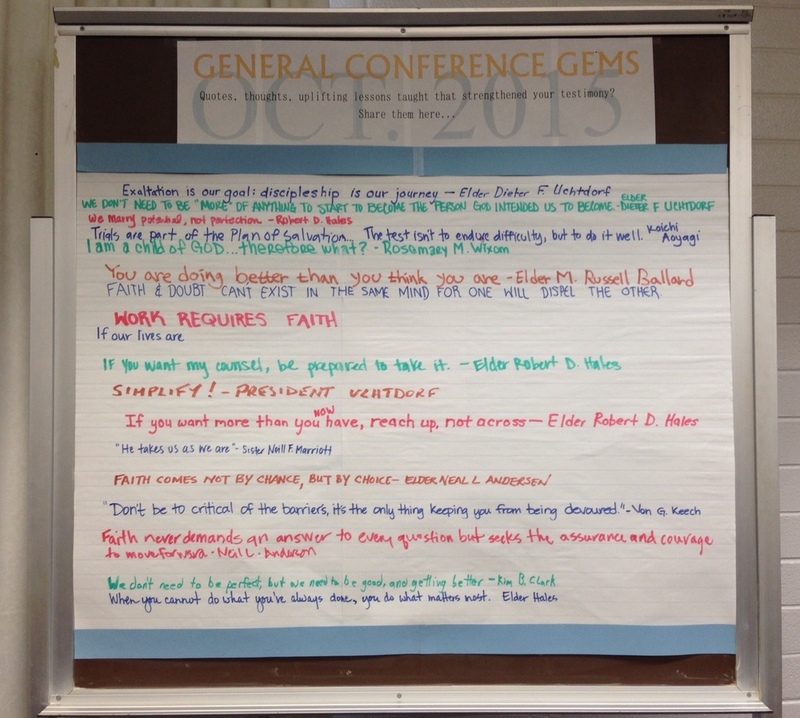 Some of the members of our branch wrote their favorite quotes from the talks on the board, and I thought you might like to see them too. Enjoy!